The legend of Groundhog Day is based on an old Scottish couplet: "If Candlemas Day is bright and clear, there'll be two winters in the year." With that in mind, groundhogs across the country (most famously Punxsutawney Phil) emerge from their dwellings on February 2 and judge whether winter is waning or we have six more weeks to go. The very first Groundhog Day took place in 1887 at Gobbler’s Knob in Punxsutawney, Pennsylvania. Although not nearly as famous as Pennsylvania's Punxsutawney Phil, New York City has its own groundhogs and events to celebrate Groundhog Day. The Staten Island Zoo is home to groundhog Staten Island Chuck. 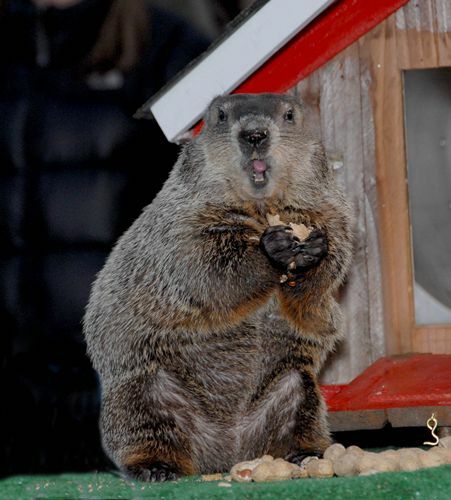 At 7 a.m. on February 2nd, Staten Island Chuck will make his official prediction. Staten Island Chuck will be making appearances throughout the day. The ceremony is free to attend. You'll want to arrive before 6:30 a.m. when the gates open. Chuck's big reveal is at 7 a.m. Sometimes the mayor attends the event. In 2009 the groundhog actually bit Mayor Mike Bloomberg. In 2014 Mayor Bill de Blasio famously dropped the groundhog (and the groundhog died a few months later.) Full details are available on the Staten Island Zoo web site. The Nitehawk Cinema, a theater chain in New York City that serves food and drinks during movies, stages special screenings of Groundhog Day, the 1993 movie starring Bill Murray on February 2. Theaters open 30 minutes before showtime, and although you can buy tickets in advance, seating is on a first-come, first-served basis. Their menu offers a great selection of choices from typical movie popcorn to more substantial fare. Wave Hill, a public garden and arts center in the Bronx, is staging a Groundhog day breakfast this year (inside of course!) Think waffles and pancakes galore for the entire family. Reservations are required. You can sign up on their website.